1.This Yearbook refers to the development and information of agriculture,forestry,animal husbandry,fishery,land reclamation,farm machinery,water conservancy,meteorology,agricultural natural disaster,etc.in China.It has been published both in Chinese and English since 1985. 2.The English edition bases itselfmainly on the Chinese edition of China Agri-culture Yearbook 2016.The compilation isunder the auspices of the Ministry of Agricul-ture and from the assistance of various minis-tries and state departments concerned.Thedata of the statistics of agricultural economyare from the National Bureau of Statistics,Ministry of Agriculture,State Forestry Ad-ministration,Ministry of Water ResourcesChina Meteorological Administration and General Administration of Customs,etc. The English edition of this Yearbookdoes not include the information fromHongkong,Macao,and Taiwan Province ofChina unless specially stated. The overall structure of Beijing Statistical Yearbook remains basically stable. In color pages, main tendency and changes about economic and social development of Beijing have been presented with both illustration and pictures; statistical tables are the main part of this Yearbook, mainly including 23 chapters, i.e. General Survey; National Accounts; Population and Employment; Government Finance and Tax Revenues; Energy, Resources and Environmental Protection; Total Investment in Fixed Assets and Real Estate Development; Foreign Trade; Price Index; People’s Livelihood; Public Utilities; Agriculture and Rural Economy; Industry; Construction; Tertiary Industry; Transport, Post and Telecommunication Service; Wholesale and Retail Trade, Accomodation and Restaurants; Tourism; Finance and Insurance; Education and Culture; Science and Technology; Health Care and Sports; Social Welfare, Community, Plicies & Laws and Others; and Development Zones 23 chapters in total, reflecting the economic and social development situation across the city through multiple industries and fields. Conventionally, the year indicated in the book is the year of publication. The latest data indicated in the statistical tables in this Yearbook are data in the previous years. 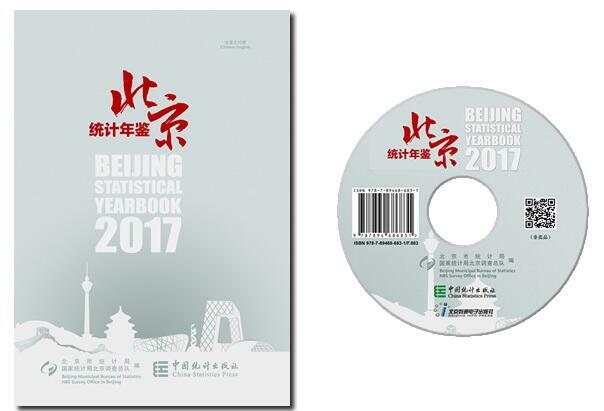 For example, this book is titled 2017 Bejing Statistical Yearbook, which means it will be published in 2017 while the lastest data in the book is by the end of 2016. #: means that the item is included in the total. Grouped indicators marked with “#” are part of the total, while those without“#” mean that sum of inclded items equals to the total. In addition, some of the historical data in the latest yearbook may have been adjusted over data in previous yearbooks. Therefore please refer to the latest yearbook when enquiring or using historical data. The order of certain chapters has been adjusted in this Yearbook. 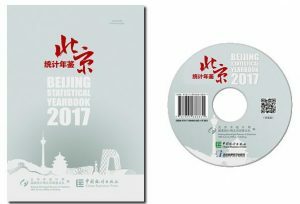 In accordance with the unified requirements of the National Bureau of Statistics of the People’s Republic of China (NBS), since January 2016, a new Circulation and Consumer Price Statistical Form System has been implemented by the circulation and consumer price statistics in Beijing, of which the survey item directories for consumer price and retail price were revised. According to the requirements of national statistical system, the statistical year of 2015 began to be used as a new round of base period for comparison in 2016. In accordance with the deployment of the National Bureau of Statistics of the People’s Republic of China (NBS), the reform of calculation method of regional R&D expenditure has been implemented since 2016, according to which the part of R&D expenditure not included in GDP figures were calculated additionally and GDP figures of 1996-2015 were adjusted. Moreover, the proportional data of internal spending of R&D expenditure in GDP, the energy consumption per RMB 10,000 GDP and decrease rate in 2016 and the energy consumption per RMB 10,000 GDP have also been adjusted. Continue to strengthen the text revision work to make it easier for readers to understand the data changes. 1) To revise the content of the overview part of each chapter, comprehensively reflecting the data content, data sources, statistical standards and the historical changes of data and so on; 2) To timely revise or adjust the explanation part of the major indicators attached after the body text in each chapter according to the changes of indicators and the content of indicators of that very year and so on; 3) To update the content of notes under the tables, accurately reflecting the changes and adjustments of the data approach of that very year to make readers understand the data changes and accurately use the annual statistical data in different periods and different sectors; 4) The names of certain units have been revised uniformly according to the adjustments to the administrative bodies in Beijing. 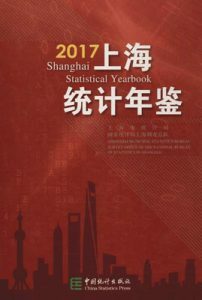 Ⅰ.Shanghai Statistical Yearbook 2017 contains comprehensive statistics of Shanghai’s social and economic development in 2016 and selected data of some important years and of the period since China adopted the policy of reform and opening to the outside world. Ⅱ.The book is composed of 23 parts viz.1.General Survey;2.Population;3.Employment and Wages;4.National Economic Accounting;5.Fiscal Revenue and Expenditure;6.Energy and Environment Protection;7.Investment in Fixed Assets;8.Foreign Economic Relations,Trade and Tourism;9.Prices;10.Living Standards;11.Urban Construction;12.Agriculture;13.Industry;14.Construction;15.Transportation,Posts and Information Transmission;16.Wholesale and Retail,Hotels and Catering Services;17.Finance;18.Real Estate;19.Science and Technology;20.Education;21.Health,Social Security and Social Welfare;22.Culture,Sports;23.Laws,Notary and others.In order to make readers using materials correctly,brief introduction and explanations of major statistical indicators are attached after every chapter. Ⅲ.Main part of the data in this yearbook are investigated and collected by Shanghai Municipal Statistical Bureau and Survey Office of the National Bureau of Statistics in Shanghai,except those with special notes. Ⅳ.The international standard unit of measurement is applied in this book.All amounts are denominated in RMB,except those with special notes. Ⅴ.The prices used for calculating of gross indicators in this yearbook are current prices. Ⅵ.Statistical discrepancies in this book due to rounding are not adjusted. Ⅶ.Marks in this book:…means not large enough to be rounded into the least unit of measurement;blank space means data are not available;#indicates major item in a category. Ⅷ.Previous editions of Shanghai Statistical Yearbook have won wide acclaim among the readers.In order to get further improvement in the yearbook editing,we welcome all candid comments and criticism from our readers. 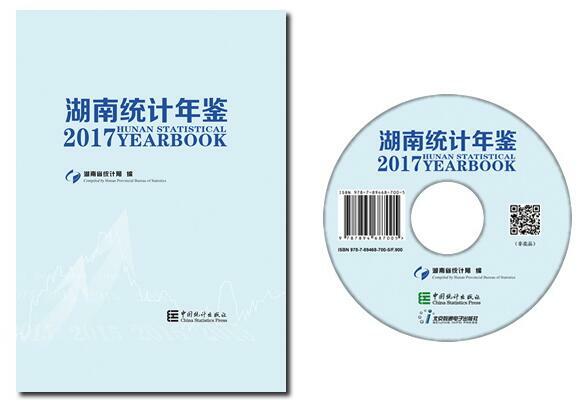 Ⅰ.Hunan Statistical Yearbook-2017 is an annual statistical publication, which reflects comprehensively the economic and social development of Hunan. It covers data for 2016 and key statistical data in some historically important years at provincial level and local levels of cities, prefecture and counties. Ⅱ.Hunan Statistical Yearbook-2017 includes a special issue and statistical figures. The special issue are Government Work Report and Statistical Communiqué of Hunan Province on the 2016 National Economic and Social Development. The statistical data contain the following 20 parts: 1. General Survey; 2. National Accounts; 3. Population; 4. Employment and Wages; 5.Investment in Fixed Assets; 6. Foreign Economy ,Tourism and Development Zones;7. Energy ;8. Government Finance, Banking and Insurance; 9. Construction of Cities and Environmental Protection; 10. Agriculture; 11. Industry; 12. Construction; 13. Transportation, Postal, Telecommunication and Other Services; 14. Wholesale and Retail Trades, Hotels, Catering Services; 15. Education, Science and Technology; 16. Culture, Sports and Public Health; 17.Party and Mass, Politics and Law, Social Service; 18. Regional Economy; 19. Main Economic and Social Statistics Indicators of Cities and Prefecture;20. Main Economic and Social Statistics Indicators of Counties and Cities (districts). To facilitate readers, at the end of each chapter, Explanatory Notes on Main Statistical Indicators are included. Ⅲ. In comparison with Hunan Statistical Yearbook-2016, following revisions have been made in this new version in terms of the statistical contents and in editing: Cut the main economic and social statistics indicators by provinces, municipalities and autonomous regions table；Starting from the 2016 annual report, the research and development expenditure accounting method reform, and corresponding to the 2004 GDP historical data has been revised; In Chapter 15, the Basic Information on the new enterprise innovation table, the entrepreneur’s understanding of innovation and the relevant situation table、the overall situation of large-scale Industrial enterprises Innovation activities table；In Chapter 20, the main economic indicators of enterprises above designated size are deleted；adjust the Situation according to the professional and departmental report,relevant statistics are increased or adjusted to enrich relative statistical indicators in different degree. Ⅳ. All of the value indicators in this book are calculated by the same year’s prices. All of the indices are calculated by the constant price. Explanatory notes are provided behind the list in which if there are changes. Data of the book are composed by computers. Ⅴ. The book is edited according to the frame and standard of China Statistical Yearbook. The indicator explanatory notes are edited according to China Statistical Yearbook, and the units of measurement are internationally standard measurement units. The notations are standard notations of China Statistical Yearbook. Ⅵ. Figures in Government Work Report, and the communiqué are preliminary statistics. Ⅶ. Notations used in the yearbook: “#” indicates the major items of the total; “(blank)” indicates that data are not available or the figure is not large enough to be measured with the smallest unit in the table. Ⅷ. Based on our limited level, perhaps there are some mistakes in the book, we welcome all candid comments and criticism from our readers. The Yearbook describes the development of China’s hi-tech industry during the period from 2000 to 2015. Statistical series for the years 2000 to 2016 include production, R&D and related activities, investment on fixed assets, and relative international comparative measures of this fast-growing industry. The Yearbook should serve as a useful source for the public planning and administration sector as well as the broader business and research communities for understanding recent developments in China’s hi-tech industry. The data of High-Technology Industry (Manufacturing Industry) for the year 2016 in the Yearbook include Manufacture of Electronic Chemicals data, but historical data are not adjusted retroactively. Notations used in this book:“(blank space)”indicates that the figure is not large enough to be measured with the smallest unit in the table or data are unknown or are not available. Statistical discrepancies due to rounding are not adjusted in the yearbook. Eastern region include Beijing, Tianjin, Hebei, Shanghai, Jiangsu, Zhejiang, Fujian, Shandong, Guangdong and Hainan. Middle region include Shanxi, Anhui, Jiangxi, Henan, Hubei and Hunan. Western region include Inner Mongolia, Guangxi, Chongqing, Sichuan, Guizhou, Yunnan, Tibet, Shaanxi, Gansu, Qinghai, Ningxia and Xinjiang. Northeastern region include Liaoning, Jilin and Heilongjiang.